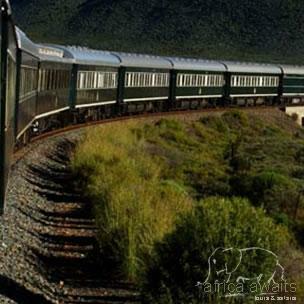 Since its establishment more than 10 years ago, Rovos Rail has earned an international reputation for its truly world-class travel experiences. Step aboard the wood-panelled coaches - classics remodelled and refurbished to mint condition - and enjoy fine cuisine in five-star luxury as some of the most varied scenery imaginable unfolds beyond the windows. Recapture the romance and atmosphere of a by-gone era, when privileged travellers experienced the magic and mystery of Africa in a relaxed and elegant fashion. In a series of journeys lasting from 24 hours to a fortnight, the Pride of Africa links some of Africa's greatest destinations from Cape Town at the tip of Africa to Dar-Es-Salaam in Tanzania, from scenic splendours as diverse as the game reserves of Mpumalanga to the Victoria Falls, from the desert landscapes of Namibia and the stark beauty of the Karoo to the lush canefields of KwaZulu-Natal and the magnificent Garden Route along the Cape South Coast. The new headquarters and the heart of this superb private railway company is the historic and newly built Capital park Station and Locomotive yard which is situated on the outskirts of Pretoria. With the arrival of electric and diesel engines, the steam locomotive sheds at Capital Park experienced a steady decline. 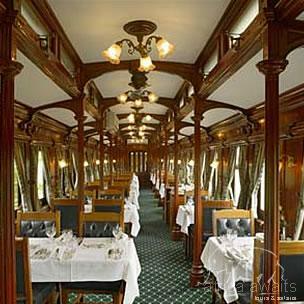 In January 1998, Rovos Rail was successful in obtaining a long-term lease over Capital Park. The site covers 25 acres, has 15 lines totalling a distance of 7km, of which a hundred metre section is under roof, and has a coal stage with 40 loading chutes. All the rolling stock, consisting of 60 carriages and 5 locomotives, the administrative offices, stores and workshops are now based at Capital Park. The aim was not only to rebuild the site to a world beating standard, but also to transform it into a working railway museum. The eyes of rail enthusiasts will be drawn to the loco sheds, where a team of dedicated personnel keeps the rolling stock in good order. The gracious colonial-style railway station serves as an elegant departure and arrival stage for the journeys. For many visitors to South Africa, there's no finer way to see the country than on the popular weekly journeys between Pretoria and Cape Town. One of the world's top destinations, Cape Town offers a blend of cosmopolitan city life, mountain splendour and scenic winelands. The twin cities of Pretoria and Johannesburg in Gauteng form South Africa's economic heartland and the ideal departure point for the Lowveld's world-famous game reserves. From the coast, the 1600 kilometre route follows an old pioneering trail carved out of the African bushveld, passing through the winelands and climbing up to the interior through the Hex River Valley. Highlights of the north and southbound routes include visits to the historic village of Matjiesfontein, a 100-year-old refreshment stop in the arid Karoo, and Kimberley (city of De Beers), the diamond boom-town that's home to the Big Hole, the world's largest man-made excavation. The routes of The Blue Train - both scheduled and chartered - take guests through some of the most breathtaking countryside to be found anywhere in the world. 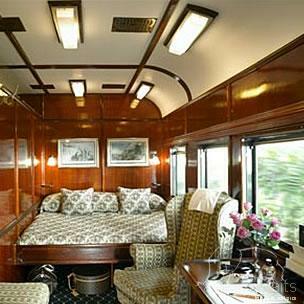 With your holiday, safari or business trip from in to ROVOS RAIL in Journeys by Train.